It is not unusual to feel worried or even scared if you suspect that you are being spied on. It is unpleasant and it is important that you take the right action. In this case, that action should be to engage the services of a professional to undertake an electronic sweep of your premises. The process of counter surveillance begins from the moment you discover or suspect that you have been bugged. It is important to act as naturally as possible, without giving any information away in any areas that may be affected. To this end, you should assume that your entire building, or home, is potentially compromised. Start your fight back by contacting a professional private investigator with experience of this type of invasion of privacy. Make sure you do this on a line that is not affected, so away from home or your place of work and not from your mobile. Experienced companies will take you through a range of questions to assess your threat level and to gauge who may be behind the surveillance. They will then arrange a time when they can carry out the bug sweep without raising any suspicions. Once the sweep has been carried out, most companies will also undertake the removal of the devices and arrange a full security report for you. This will aid you in taking further action; whether this is to report the matter to the police or to take direct legal action. The steps you take should be measured against your own safety, and shouldn’t involve direct confrontation with the person you suspect of placing the bugs. If you are looking for the very best in electronic sweep investigators, then look no further than Advanced Sweeping. We will support you every step of the way and ensure that your home or office is restored to its former privacy level. 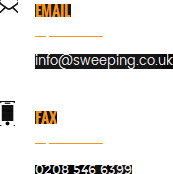 Contact us today at info@sweeping.co.uk or head to http://sweeping.co.uk/ to find out more.